True to my obsession, last Monday I joined about 60 other Sarasota souls who braved tropical storm Debby’s blustery gales and sheets of rain to soak up yet another Dial Tone experience out at Jake’s Tavern on Clark Road. Unlike past articles, this time I’m going to step back and simply let the images, words, sounds and feelings captured in those images and words speak for themselves. I’ve attempted to give this string of media a flow to mirror that of the show itself, from beginning to end. The following are excerpts of poetry by Steve McAllister, Zachariah “Skylab” McNaughton and Lois Betterton, which weave together the photos and artwork of the visual talent present — all recruited by the diligent organizer-facilitator John Lichtenstein. There’s actually a wealth of additional creative output; be sure to check out “further reading” at the end and follow the project on Facebook to stay connected and experience this for yourself at the next show on July 31. Live art by Eric de Barros. Mike Murphy on drums. Photo by Scott Braun. TEOTDRECMBB organizer John Lichtenstein. Photo by Scott Braun. Guitarist Johnnie Barker. Photo by Matt Gunter. Lalo. Photo by Matt Gunter. Steve McAllister writing. Photo by Scott Braun. Steve Apostoli on hand drums. Photo by Scott Braun. Garret Roberts on keys. Photo by Scott Braun. Kari Bunker on vocals. Photo by Scott Braun. Urban Spiral Dance Company dancer. Photo by Scott Braun. Live art by Van Jazmin. Artist Hunter Slade. Photo by Matt Gunter. Ryan O’Neill. Photo by Scott Braun. Johnnie Barker. Photo by Scott Braun. Artist Sishir Bommakanti. Photo by Van Jazmin. between the bosoms of sound and silence. – View the full poem at Steve’s blog, InkenSoul. Universes no longer parallel, diagonally rotating on the horizontal and colliding with bouncy black leather couches in a giant dark room with drums beating randomly at first. Then becoming a rhythmic chant without human words, with jungle words. No, not words, not words at all. Bling, blong, bling, bling, bam…electronica joins in as unjazz, infusion of unfuzion, unjazzy, and yet beginning to form…Something. Like the lightshows at the Fillmore only with sound; swirling colors of sound, like giant pinwheels or bubblegum or cotton candy infused with candied apples, crazy to the core. 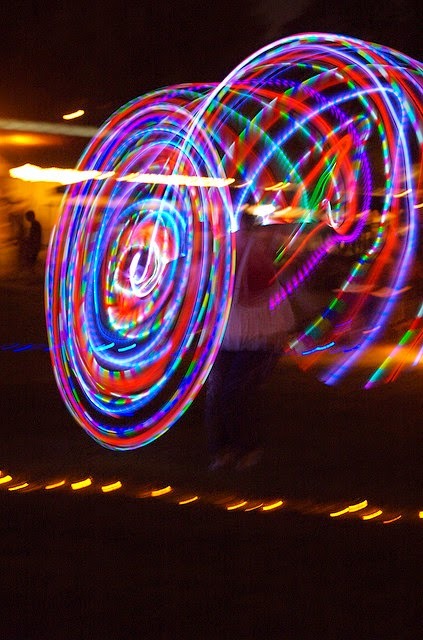 And a pretty tiny faerie with Animee pigtails begins to spin electric hula hoops, blazing rainbow hula hoops that morph into giant pink flags, cautionary flags of butterfly wings twirling and enveloping her. Wrapping her up and then flying away in the sounds that fly by and that relentless beating. Heartless beating, booming without a soul or a heart…primal in every way. And, oh no, now a tall lanky bearded giraffe-man in furry horned helmet with…what??? Tiny glowing hula hoops! Twirling them…he’s three times the faerie’s size and yet his hoops are half the size of hers. That’s an impossible geometry I’m witnessing right there. I think the barometric pressure has affected my brain, has removed any and all signs of equilibrium. And all my senses have become a blurr. Next time, I urge you: don’t just get the re-cap — experience it for yourself! NEXT SHOW: July 31 at Growler’s Pub, 9 pm. This entry was posted in Being an Artist, Building Community, Local Events, Music, Published Articles, Stories Behind Artwork and tagged April Doner, art, artists, collaboration, community, dance, end of the dial tone, eric de barros, experimentation, florida, Hunter Slade, improvisation, jake's tavern, john lichtenstein, Kari Bunker, live art, local, lois betterton, matt gunter, mike murphy, music, musicians, painting, performance, photography, poetry, radical, sarasota, scene, scott braun, Sishir Bommakanti, this week in sarasota, van jazmin, writing, zachariah skylab. Bookmark the permalink.